Hull is about to celebrate its biggest New Year ever. At midnight it becomes the UK City of Culture, an accolade it will hold throughout 2017. Its opening event (Jan 1-7), Made in Hull, is a celebration of the city, in pictures on buildings, on a trail where the streets speak and buildings tell stories. Staged across the city centre, it uses large-scale projection on buildings, illuminated skylines, soundscapes, shop windows and live performance to celebrate the last 70 years of life in the city. Hull will spend 12 months under the international media spotlight. City of Culture status should do more than any single event in its history to, firstly, simply remind the rest of the UK where Hull is, and then to attract visitors. Civic leaders will also hope that it will promote longer term regeneration and attract business to the city. UK City of Culture status is bestowed once every four years. It was inspired by Liverpool’s success as European Capital of Culture in 2008. Hull, chosen ahead of Dundee, Leicester and Swansea Bay, is only the second UK city of culture. Derry-Londonderry, the first, held the designation in 2013. Like Liverpool, Hull is a seafaring city. But it has long had much more of an isolation issue, stuck far out in the east of the north, on the cold, wide, windy Humber. The building of the Humber Bridge in the 1970s helped connect it with the rest of busy Britain, but even today it is not a crossing that features much in the traffic news as a congestion hotspot. 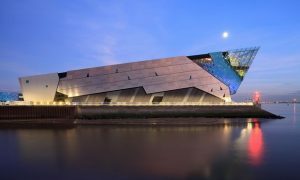 The city centre transformation, heralding Hull’s great year, includes a big make-over of the Ferens Art Gallery, (to reopen on January 13th, 2017), and a refurbishment of the aquarium The Deep, which will host revolving marine themed art exhibitions during the year. There is also a substantial revitalisation of the waterfront and public spaces. The city is promising a “vibrant” cafe culture, good food and new music venues and galleries in the arts and cultural quarter, which is how the revitalised Humber Street and Fruit Market area is now designated. I have always considered Hull a very rewarding short break destination – I worked there at the start of my career – and good train connections, including direct services from London, make those visits relatively easy. Fortune hunters, disappointed at the lack of gold underfoot in London’s streets, should try Hull instead. It is literally paved with fish. You don’t go far in the old town without treading on an oar fish or a John Dory cut in steel or set in polished slate. In his “Fish Pavement”, artist Gordon Young created a meandering A-Z of sea life, from anchovy to zander, via quid, viviparous blenny and yarling, all life-size. They come in many materials: , flying fish are in York Stone, swordfish in Cornish grey slate, and icefish are carved into Carrara marble. There’s humour too – a catfish chasing a dogfish, and a shark outside a bank. Spot all 41 on this piscatorial trail and you get a certificate. Not so long ago Hull was full of mean streets where you never went for fear of being tugged down an alley and enrolled as crew for some distant voyage. Today the city’s maritime heart beats with high-tech efficiency at port facilities the length of the Humber. The old port district houses smart offices, museums and picturesque pubs. But there is still a hint of mystery. A narrow city centre street has an exquisitely strange name, Land of Green Ginger, its origins still unclear. Walk down it to the George Hotel, for a glimpse through what may be the world’s smallest window. More ancient yet (1550) is Ye Olde White Harte in Silver Street. Little has changed upstairs since they plotted closing Hull to King Charles in the Civil War. The (refurbished) Deep, Hull’s big, bold and very striking aquarium has many fine, rare fish, swimming in fathomless tanks. But it has gathered a more unlikely accolade, as one of the 10 best places in the world to ride an elevator, alongside the Empire State Building and the Eiffel Tower, judged by USA Today. The underwater elevator rises through a transparent tube, with a stop to give visitors a mid-tank view. Architect Sir Terry Farrell designed The Deep. (His M16 block on the Thames was “blown up” in the Bond, Skyfall.) It’s in the shape of a capital A on its side, clad in aluminium and black enamelled tiles, dead centre on the waterfront, jutting out into the Humber. They tell the story of the oceans “in time, depth and latitude”. William Wilberforce, the Hull MP whose campaign to end the British slave trade was movingly told in the movie Amazing Grace, was born in Wilberforce House. Built in the 1660s, the house has seven galleries devoted to the man and his cause. It is one of the city’s rich list of free museums. Another is the (also refurbished for 2017) Ferens Gallery, with works by artists ranging from Canaletto to Hockney. The Streetlife Museum features a reconstructed shopping street, rare cars and an 1818 bicycle. The Hull Maritime Museum explores the city’s sea-going past. Next to it is the Arctic Corsair, a famous Hull fishing vessel rammed by an Icelandic gun boat in the “Cod Wars”. Literary opinion puts Philip Larkin, librarian at Hull University for 30 years, among the most important British poets of the 20th century. The poetry of Hull University’s notoriously grumpy librarian, formed a key part of the city’s bid. It is said to be beautifully phrased and elegantly constructed, with a direct and honest subject matter. Hull is Larkin’s city “on the edge of things”. Sculptor Martin Jennings matched his statue of John Betjeman on St Pancras station with a re-creation of Larkin in similarly flustered pose, rushing for a train with a manuscript tucked under his arm, clutching his trilby. The likeness is on the main Paragon station, mentioned in one of Larkin’s most famous works, the Whitsun Weddings, He writes: “I was late getting away”. I recommend two short excursion excursions from Hull. The first is to the high and mighty Humber Bridge, linking Yorkshire and Lincolnshire, just west of the city. (In 2017 Opera North will transform the Humber Bridge into a piece of music.) It’s a free, and quite safe walk, or cycle, the 4 miles over the Bridge and back (two miles each way). This is one of the best cobweb-clearing treks I know.The views from the middle are sensational. Then there is Beverley, a short train trip away on the edge of the Yorkshire Wolds, not the sort of place you chance upon on your way to somewhere else. It shines out as one of Britain’s classic little 13th century towns, with its Gothic Minster, narrow medieval streets, Georgian terraces and decorated church ceilings. If you have time, the glorious Yorkshire Wolds beckon beyond.